Hordeum: “Oatmeal Rye India-Style Brown Ale,” I suppose every brewery needs one to be viable these days. Slouch: In other words, Brown Ale? Hordeum: Thats a good lookin’ beer. Dark, sooty brown, a little cloudy. Slouch: This is what Newcastle looks like in heaven. Hordeum: This is what Newcastle looks like in hell. Slouch: Huge tan head threatening to spill over after an aggressive pour. Starting to diminish somewhat, but not without a fight. It’s like watching a jellyfish suffocate on the beach. Hordeum: A fruit fly just landed in mine. I guess that means its summer. Down the hatch little guy! Hordeum: … or just too lazy to pick it out. Hordeum: I’m not getting that much, but mine is a little too cold right now. Some chocolate, some hops but underwhelming. Slouch: Yeah, it smells like a Brown Ale. Some brown sugar, maybe a little pepper but it’s not that assertive. Slouch: Pretty decent brew. There’s certainly nothing not to like, but within this style it becomes hard for a beer to distinguish itself. The rye gives is that spiciness, but this is more approachable than one might think from the description. Hordeum: The oats add a little bit of that chocolate Oatmeal Stout goodness to the brew. Lots of bittering hops, but not so much of the aromatics that I associate with a good “India Style”. Hordeum: Pretty smooth, it doesn’t “coat” like many imperials. Goes down easy. Slouch: Gun to my head, I’d say “medium-mouthfeel”. Hordeum: If no one told me, I would have guessed this was about 5% ABV. Slouch: Agreed… would be easy to knock back too much of this one. Potential hangover, thy name is Improvisación. Tread lightly Aleheads. Three hops. Good beer, but not their best. Read Mashtun Copperpot’s take here. Posted in Aleheads Take On, Tasting Notes.Tagged 3 hops, Brown Ale, Cigar City, Improvisacion, India-style, Rye. Coincidentally, I drinks this beer last night and you are crazy not to likes more. This beer was top notch. Complex flavor without being disgusting. Character without being arrogant. Balanced beer and you are right, I could drink much of this before standing up and falling down. This is almost most favorite of Cigar City beers I have had (is #3). oh, you have typo: is to be 4 hops. This seems dead on with Copperpot’s rating except that his write-up described a much more complex nose. 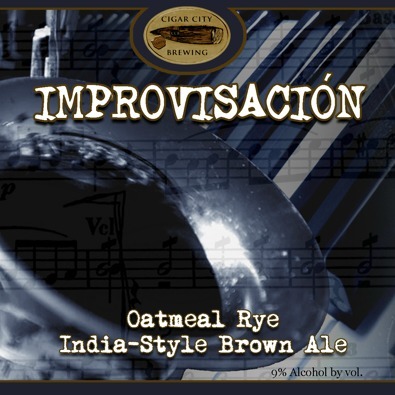 To me, the Improv tasted like an Imperialized Maduro Oatmeal Brown (which is a very good thing). As far as their big beers go, it’s about as sessionable as it gets. I’m really enjoying every CC beer I can get my hands on. Would it be so hard to call this a Brown Ale? Or an IPA? Seems like any time a brewer wants to deviate from style and hop something up a bit they have to add “India” to the label (Seems to always be on Browns and Reds). Whatever, I’d try the India-Style Dump on the Sidewalk if it had a Cigar City label on it. I actually liked the Maduro a little better, but I’m not sure how old our bottles of Improvisación were- it could be that the hop profile mellowed and made the nose less captivating. This is a very good beer, but Cigar City make such great stuff that they set the bar very high for us when it comes to grading. I’m tuning out all Cigar City reviews until they distribute someplace other than Florida, NYC and Philly. Stop wasting good beer on Florida! Yeah, this one was subtle. I think we’re all tasting the same thing, though some clearly like it more than others. I gave it 3.5 hops.